Media blackout because they love Islam I. Bed with evil! What was not covered knife wielding Muslim attacks a cop!!! Vancouver will NEVER be declared a “Sanctuary City” if Jason Lamarche is elected Mayor on October 20th, 2018! Declaring Vancouver a “Sanctuary City” would provide Illegal Immigrants from around the WORLD with a green light invitation to move here with the expectation that local Canadian taxpayers would provide them with FREE housing, food, healthcare, etc… which are all total economic impossibilities. The City of Vancouver’s 2017-2021 Budget Outlook projects that Metro Vancouver’s Real GDP growth will drop from 3.3% in 2017 to 2.7% in 2020… WRONG DIRECTION! According to The Conference Board of Canada the City of Vancouver added 61,000 jobs to payrolls in 2016 with only 14,000 jobs added in 2017… SAD! Do you see how Vancouver’s economic growth is scheduled to DECREASE over the next several years? That is because our LOCAL policies are NOT creating economic prosperity. Vision Vancouver’s failed policies rely exclusively on selling out Vancouver land and resources to the highest bidders on the global market. That is unacceptable and is a total lack of leadership. It’s the same failed Globalist agenda that is wreaking havoc across all of Canada and Canadian citizens are sick and tired of it. We need to make Public Safety a Priority through boosting the funding for the Vancouver Police Department AND the Vancouver Fire Department, ASAP! Jason Lamarche will also TERMINATE the entire Metro Vancouver board and organization and will shift Vancouver’s portion of their $700 MILLION annual budget back into LOCAL Vancouver projects to help Canadian citizens. NO. There is no way in heck that Vancouver is going to be designated a “Sanctuary City” if Jason Lamarche is elected Mayor of Vancouver on October 20th, 2018. If Jason Lamarche is elected Mayor of Vancouver, he is going to put the needs of Canadian citizens FIRST and FOREMOST. The wealth and prosperity that we create together will provide Vancouver with the ability to safeguard our local communities which will help us assist the most marginalized people in our city who need a hand-up. Make no mistake about it. Vancouver is on a downward trend, and we will NEVER be able to reverse course unless we focus on the fundamentals and build a robust local economy that will provide Canadian citizens with great paying jobs by cutting the job-killing red tape down at City Hall, and by terminating the tax-wasting, anti-democratic Metro Vancouver organization. DRAIN THE SWAMP! Designating Vancouver a “Sanctuary City” will flood our streets with knife migrants and acid throwing refugees which is NOT good for Public Safety, NOT good for local small businesses, and NOT good for the future of Canadian children. This is a CRITICAL election Vancouver! Our local economy, democracy, and public safety are at risk! Together, WE CAN SAVE VANCOUVER! 'It was carnage': 14 Injured in bus knife attack in German city of Luebeck. 50,000 'refugees' go MISSING in Canada. Expect the same, Canada. Trudeau caused it. No surprise. 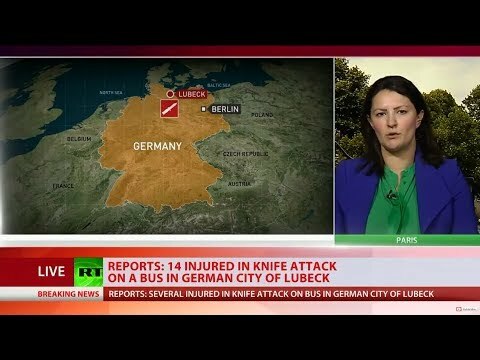 'It was carnage': 14 Injured in bus knife attack in German city of Luebeck. https://www.youtube.com/watch?v=dhK-HU9ZtvE 50,000 'refugees' go MISSING in Canada. Expect the same, Canada. Trudeau caused it. Cancelled due to Sharia - Islam. #LondonHasFallen They resort to knife bins with child's cartoon character on it to help curb knife crime. You can't spell cUcK'd without U.K.
Ban knives! Only Artificial Intelligence should be helping people to cut their food SAFELY! There's no reason why ANYONE should own a knife. Anyone who wants a knife "for personal use" is going to use it against another human being at some point. Arguments sent back to me from 2030 from leftist groups. And that's how you've always sounded to me, leftists, all my life! Ban knives! Only Artificial Intelligence should be helping people to cut their food SAFELY! There's no reason why ANYONE should own a knife. Anyone who wants a knife "for personal use" is going to use it against another human being at some point. Arguments sent back to me from 2030 from leftist groups. And that's how you've always sounded to me, leftists, all my life!